Strange Fictions Press, 9781946050021, 108pp. Prison Made of Mirrors is a gripping and grim dark fantasy fairy tale, retold through the myths and legends of the Ancient Celts and Vikings. 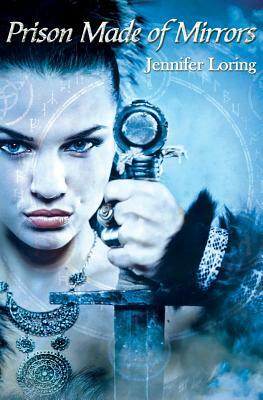 Aithne is a Celtic warrior woman kidnapped from her homeland during a Viking invasion and forced to marry her captor. Shortly before the raid that claims his life, she becomes pregnant with a child whom she believes cursed. Spurred by the dark sorcery she learns from relics her late husband's mother left behind-including a magic mirror-Aithne descends into a madness that threatens not only her child's life but also the lives of everyone around her. In this fairy tale retelling, Breanna is exiled by her mother and taken in by a clan of dwarves who treat her like their own. They soon learn that no one is immune to Aithne's lunacy-not even the prince to whom Brenna was once betrothed. Brenna must face and conquer death itself if she is to save the land that rightfully belongs to her, and to break her mother's terrible spell on the man she loves. Jennifer Loring has been, among other things, a DJ, an insurance claims assistant, and an editor. Her short fiction has been published widely both online and in print; she has worked with Crystal Lake Publishing, DarkFuse, and Crowded Quarantine, among many others. Longer work most notably includes the contemporary/sports romance series The Firebird Trilogy and the critically acclaimed novella Conduits. She lives in Philadelphia, PA with her husband, their turtle, and two basset hounds.